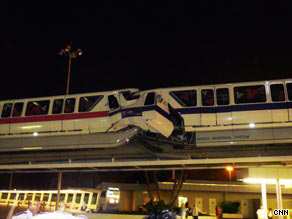 (CNN) -- Three Disney monorail workers have been placed on paid leave just days after two monorail trains crashed at the Orlando, Florida, theme park, killing one of the train's operators, according to a Disney spokeswoman. Train operator Austin Wuennenberg, 21, was killed in Sunday's monorail crash. Walt Disney World spokeswoman Zoraya Suarez said the action was "part of an investigative process, not a disciplinary action." The three workers were a monorail maintenance shop member, the monorail pilot of one of the trains and a transportation manager. Disney would not name the employees. The National Transportation Safety Board, which is investigating the Sunday morning accident, is expected to be at the park for several days. "To this point in the investigation, no anomalies or malfunctions have been found with the automatic train stop system or with any mechanical components of the switch or with either trains," the NTSB said in a statement. The crash killed operator Austin Wuennenberg, 21. The operator of the other train was taken to a hospital, where he was treated and released. Additionally, six passengers on Wuennenberg's train were treated at the scene for minor injuries. Wuennenberg was piloting the "Purple" train. The other train, known as the "Pink" train, was operated by one of the employees who has since been placed on leave. The Pink train was instructed to go back through a track switch that would take it from the monorail's Epcot loop to the Magic Kingdom loop. "For undetermined reasons that are currently under investigation, the switch had not changed position needed to allow the Pink train to be routed to the Magic Kingdom loop," putting the Pink and Purple trains on a collision course, the NTSB statement said. NTSB investigators believe that Wuennenberg attempted to put his train into reverse before the collision, attempting to avoid the crash. The Orange County Sheriff's Office, which is investigating Wuennenberg's death, would not comment, citing the ongoing investigation.